I haven't been posting because my computer, which I call Connie, has been sick. Very sick. Connie is better now. However, she is getting a new younger sister that will get picked up this afternoon. Name to be determined. In the meantime, there are a couple of finishes. Remember Cindy's Panda Twist? You can see it here. It is now ready to go to our Community Relations group with Quilters by the Sea. Thank you for your the input on the flange. I decided to use the Nascar check and make the faux piping binding. Love that trick. 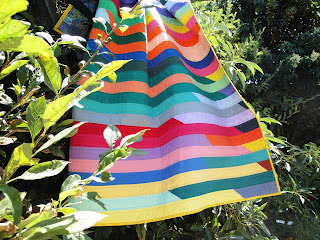 Also, if you follow Robin's blog, you know we have been making a healing quilt together. Here is the link. It is now finished and ready to be delivered this weekend. And lastly, before I go to pick up Connie's new sister, here is a photo of how the avocado tree (named Kalani's tree) is doing. Come December and January, guacamole will be in order. Do you like to watch award shows? You know the ones I mean, the Oscars, the Tonys, or the Emmys? I do. I have a good friend who always comes over to watch these with me. 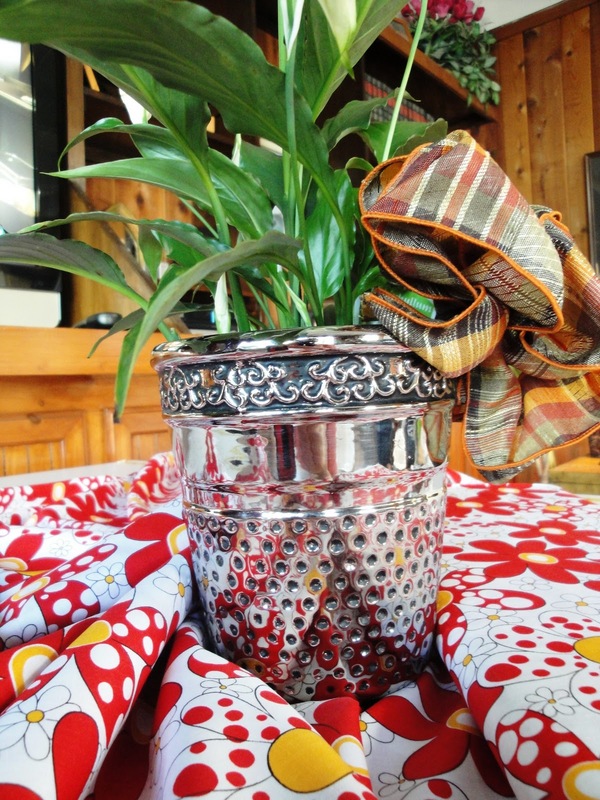 On Sunday she brought me this fabulous potted plant. (Thanks Susan) Don't you just love that thimble? It is sitting on the fabric I hope to cut out tonight. It's Robert Kaufman Daisies and Dots. I decided I needed a break from the moon quilt. So, except for working with Robin on a quilt the past two days, I have not been sewing much. Go on over and take a peak; it is cute. 1. I think part of a best friend's job should be to immediately clear your computer history if you die. Or in a quilter's home, your quilt room and divvy up the stash. 12. Can we all just agree to ignore whatever comes after BlueRay? I don't want to have to restart my collection...again. And if you have made it this far, Rule 23. Bribery can work. 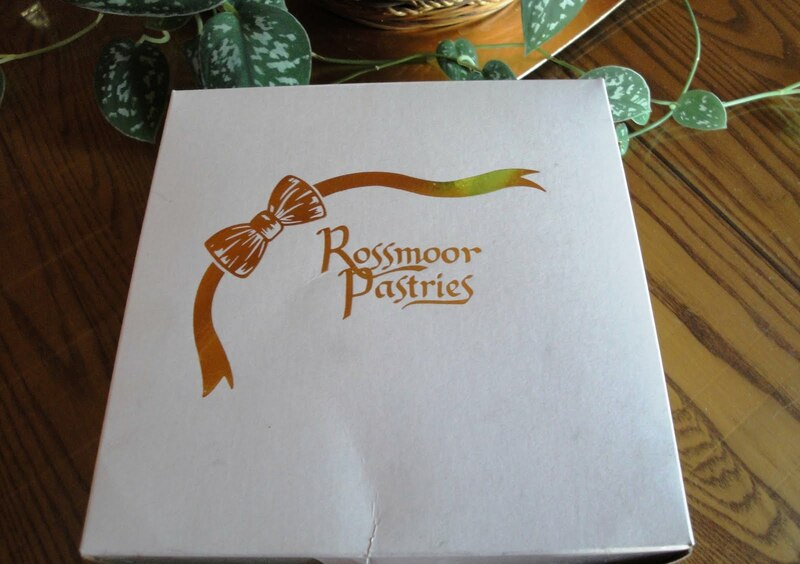 If you make it to the Quilters by the Sea board meeting tonight, this will be there. Do you follow Geta Quilting Studio's Blog? It's a good one. A while ago she posted that she needed a little help, you can read about it here. She was looking for a name for her newest patten. I had been following her progress for awhile and thought it had a crisp, modern look to it. 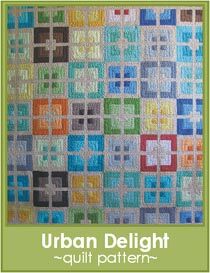 I suggested Urban Delight and she liked it. I won! She sent me her wonderful pattern as my prize. Thank you so much Geta. 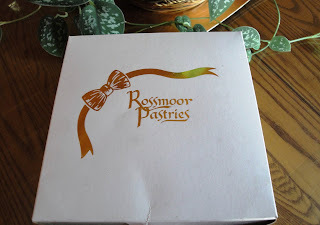 I am looking forward to making it. Read all about Geta's newest pattern here and how you can get your own. And I'm beginning to lose my patience. Tomorrow marks the 10th anniversary of 9/11. I bet most of us have a story to tell. I've been reading several on the blogs I follow. Living on the West Coast, it was early morning and I turned on my TV upon wakening. Katie Couric and Matt Lauer was talking about a freak accident where a plane had flown into one of the World Trade Center buildings in New York City. It was only a short time until we saw the 2nd plane fly into the other World Trade Center building. Now everyone knew this was no accident. And they also were reporting about the the Pentagon. I immediately knocked on the other bedroom doors to tell everyone to get up to watch TV. Life, as we knew it, had changed. 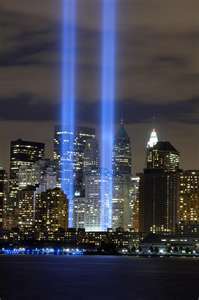 I still am saddened thinking about the immense loss of life and the why of it all. I love this image. Thank goodness our spirit and hope still soars upward. Do you have a story to share about where you were or what you were doing when you heard about this? I hope you will share it. Remember that Jelly Roll Race we had at our guild retreat? Mine is finished, quilted, bound, and in the washer to take to guild tonight. I just did a simple straight-line quilting and even stitched the binding down on the machine. It's a good boy quilt, don't you think? I am working on my October UFO for my guild. This is Part One. It will make more sense as I go along. So, stay tuned. I am having sooooo much fun with this one. 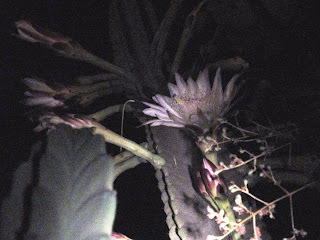 Are you familiar with the night-blooming cactus known as, Queen of the Night? There is one in my backyard. For obvious reasons, it is hard to get a good picture. I took this picture this evening before it got completely dark. Here is one that I took last night. It doesn't bloom every year; but it does most years, and the bloom only lasts one night. This cactus is very large with over 50 blooms that will pop out a few each night until they are all gone. I just love this plant. Isn't mother nature fabulous? I see it spelled both ways, and spellcheck doesn't care. So, I looked it up on line. Seems either is right. Grey is the English way of spelling it. Gray is the American English version, wanting to be more phonetic at some point. 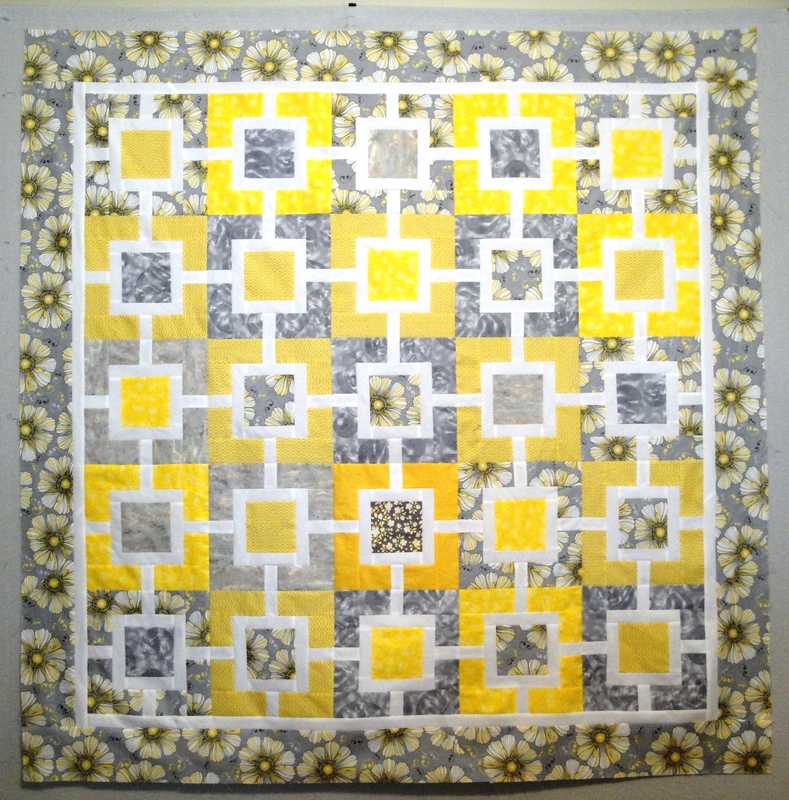 That being said, here is that yellow and grey or gray quilt top I need? 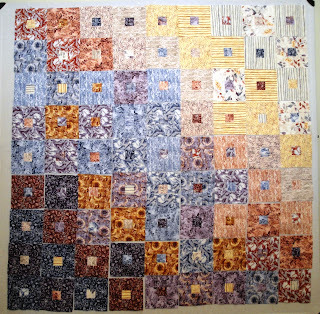 My inspiration came from Hyacinth Quilt Designs, Garden Fence. 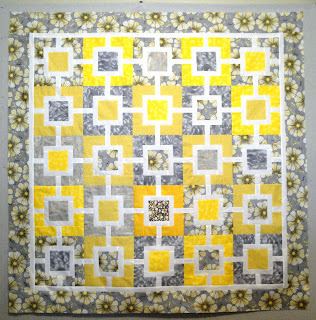 I left out the sashing, added a larger border and made it square.﻿ I'll just add that to the "need-to-quilt" pile. Baby isn't due till December and I hear the nursery is being decorated in yellow & grey or gray.